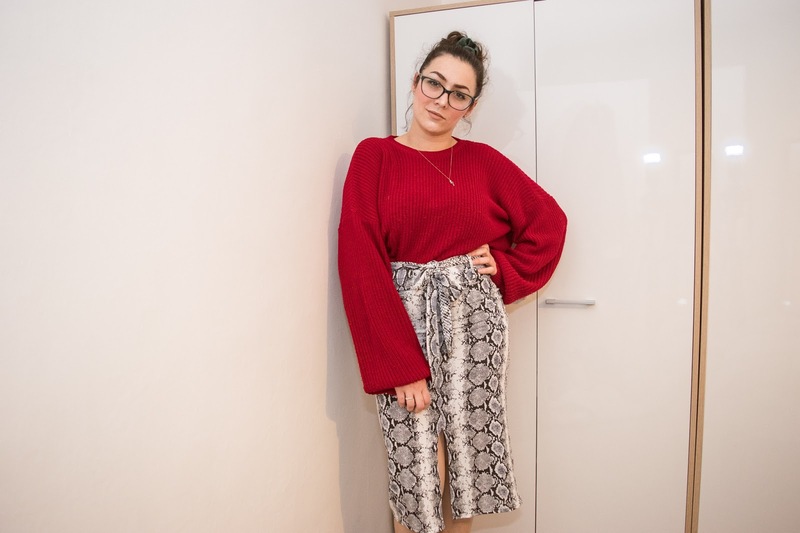 I tried something new this week with this outfit and I took inspiration from a bunch of my favourite style bloggers who have been styling midi-skirts in a similar way over the winter season. I've been overdue trying out this look for myself so I finally put something together and I quite like it. I'm late to the party with this trend but I've been out of the style game for some time over the last year and I'm ready and excited to get back in it again. I'm really enjoying what I see online and in-stores at the moment and I'm excited to shop for some new staple pieces in the new wardrobe I'm planning to create myself. I'm planning some time this weekend and over the coming weeks to finally KonMari my wardrobe so that it sparks joy and makes me excited about my clothes again. I know I have some good pieces in there but they're hiding under the mountains of clothes I don't wear anymore and have no intention of wearing, but still keep "just in case, because it is cute". One thing that will be keeping a very permanent and prominent place in my wardrobe is this red jumper from Femme Luxe Finery. I cannot tell you how often I wear this jumper and how much happiness it brings me. I'm pretty much in it at least once every week and usually style it with high waisted jeans and trousers. I adore the colour, I'm obsessed with the long sleeves (even though I think they've got longer in the wash) and I love the slightly cropped look making it perfect to wear with skirts, jeans or even dresses as a layering piece. It's one of my newest additions to my ever growing (as soon shrinking) knitwear collection but it already has a place in my heart as a true favourite. I think every new thing you get is a favourite for some time, which is why I think I use the word 'favourite' too often. So much so, that I feel it loses it's meaning. But this jumper: it's a true favourite. A true favourite to me, being something I've had for some time that I still love. I feel like these are the pieces Marie Kondo is teaching us to keep. Not those that are the newest, but those we love the most. Like she says, the ones that spark us joy. This one sparks me a lot of joy simply because it's red, cosy and versatile. I paired this true favourite with a recent addition to my skirt collection. I bought this snake print skirt in the boxing day sales and I really enjoy the print. 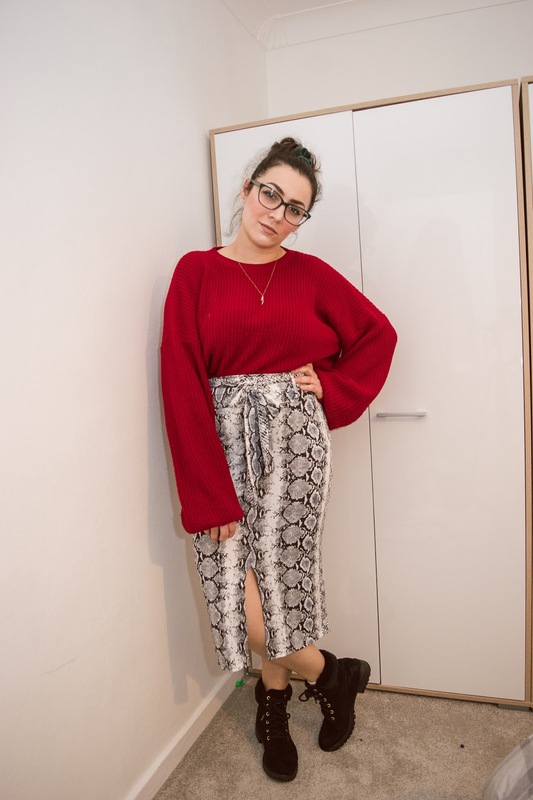 I've always been a fan of the snake print and wanted things like snake print trousers and skirts so I'm glad to see it in style. With Marie Kondo and her KonMari method in mind, I don't think this skirt it sparks the same joy for me as my jumper does but I feel like there's different levels of joy. There's the joy things give you because it's your one of your true favourites and you wear them all the time, there's the things that have fond memories or that give you joy because it's on-trend. And then there's things that spark joy because they're simply fresh and new. It makes me question how clearing out my wardrobe will work and how I'll do with it. I know I need to get rid of a lot but I don't want to get rid of anything that I might regret. I guess the pang of guilt will follow putting something on what feels like the wrong pile. I guess that in your heart of hearts you'll know what you truly want to say goodbye to and what you don't. Recently I did a HUGE wardrobe overhaul and threw out everything I hadn't worn in the past 6 months or so. I thought there's no point in hanging onto things I'm not that fond of - and I feel so much better for it! I hope it goes well - also love the midi skirt/jumper combo, it's so chic.